I seriously adore Lauren and Chris!!! 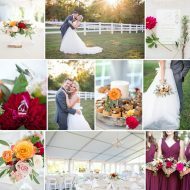 They have the best personalities, cutest love story, and wow- they sure know how to throw an elegant and fun wedding!! Lauren and Chris first met briefly through a mutual friend and life led them their separate ways. Then, five years later they crossed paths again at a wedding, and the rest is history! Lauren said she knew immediately he was a keeper when he was willing to drive the following weekend after the wedding from Lexington, KY to Richmond, VA to take her on our first date! I can’t explain what a tremendous honor it was to fly to Florida for their big day, and I’ll forever cherish all the memories and relaxation time with this sweet couple and their awesome family and friends. Seeing how many people traveled from afar made me realize even more how much these two are loved. And, thankfully, hurricane Matthew stayed far enough away to not interrupt the festivities. I cannot rave enough about their venue: The Destin Bay House! 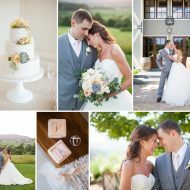 With stunning backdrops, an intimate setting, and a fantastic staff – it is truly a dream location! I had to hold back happy tears the entire morning while Lauren got ready – she is breathtaking (inside and out!) and deserves all the happiness in the world! Again, tears flowed as her sweet brother walked her down the aisle! Chris looked mighty dashing too I must add! And, just wait til you see his dance moves! The beautiful Florida weather enhanced the carefully planned details and stunning decorations. Lauren’s DIY projects and Florals by the Sea truly outdid themselves! Lastly, I have to add that their message-in-a-bottle guestbook is my favorite idea I’ve seen yet! I could honestly gush over the details all day, and I’m sure you’ll understand when you browse my many, many favorite photos below!!! Plus, checkout the list of awesome vendors at the end. CONGRATULATIONS Lauren & Chris! SO happy for you two!